Simon Gibbs finally admits that Anna Raccoon’s piece was a ‘Sting’, and that he trashed the Libertarian Party website. Still waiting for Malpoet and his mad little friend to contact Avon and Somerset. So it can be explained to them very very slowly that the Electoral Commission changed their reporting procedures, and be handed an harassment notice, as five years harassment is evidence of continual behaviour. I think that it was the news that one internet troll has been exposed as one of the trolls that made life unbearable for the McCann’s and do the the decent thing that has made me reactivate this site. Posts will be mostly social, political and business related. This weekend it is the Social Democratic Party’s Conference in Brighton. I have always refused to use the appellation ‘Liberal’ as in the inverse takeover of the Liberal Party by the SDP the dumped any remaining liberal virtues of the party of Gladstone. The essentially decent Eurocrat Nick Clegg has apologised for the policy committment made on free tertiary education fees made by his party, never expecting to go anywhere near the levers of power in Whitehall. The ever disloyal Cable says of course I always thought this was an unwise policy committment. The showdown is set for a showdown between Clegg and Cable and his soft left supporters in the SDP wing for the top job. I cannot think of anybody more untrustworthy to be hold the position that Cable occupies as Secretary of State for Business Innovation and Skills. Clearly that is why Cameron in the last reshuffle put Michael Fallon in as a minder at DBIS.Fallon is making statements that Government should step out of the way of business and let it get on with leading us out of recession. 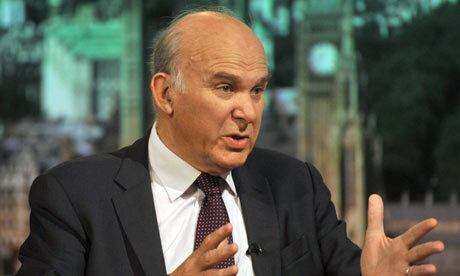 Cable with his old Labour hat on wants regulation, regulation and more regulation. The promised business bank will never happen, because most of the big banks have been nationalised, or are in thrall to the State through soft loans. Control of the commanding heights of the economy has been the socialist dream since Marx. As a left wing social democrat why should Cable wish to change that scenario. I have met with a senior Conservative who has sat across the table from Cable who has told me that with regard to Cable ‘when your fellow politicians tell you you have got an ego problem, you really have got a problem’. Another senior conservative was quite open with a shared view that be could be charitably summed up in the phrase ‘ he is a stranger to the truth’. No wonder he has a minder, and is not allowed to make any speeches that have not been cleared first. My own dealings with Cable, that will be published in a book when concluded, certainly lead me to the conclusion he is unfit to hold office, and the circumstances of which lead asenior Judge on the Bristol Circuit to conclude that he found my assertions of Misconduct inPublic Office, which he corrected to ‘Misfeasance in Public Office’ the most persuasive. He is not averse to breaking the Ministerial Code if it suits his personal political agenda. The Secretary of State’s private office (then under Mandelson) was served with a Freedom of Information and Data Protection request in October 2009. It was ignored. I was trying to find out what had caused DBIS to launch an action against me when in May 2009 their independent assessor had told them there was no reason to launch any action. In September 2010 The Information Commissioner wrote to Cable’s private office instructing them to release the documentation they had on me. They denied they had anything. In October 2010 I sued Cable in the Bristol Courts under the Data Protection Act. The Treasury Solicitor was instructed to defend. Two days before the hearing the treasury Solicitor wrote to the Court and myself asking for an adjournment because they had found a file that had been overlooked (?). The Treasury Solicitor paid my legal costs and the file was finally released. There sitting in the file was a memo that was a bare faced lie from a solicitor in the payof DBIS, ensuring that evidence I had requested was kept out of Court and forgeries were kept in. December 2010 solicitors acting for Cable were instructed by the Judge to agree wording to exclude politica parties. DBIS have never acted on the Judge’s direction. Through out 2011,the Libertarian Party was monitored online by DBIS,using a ‘Rippers’ software.All of which was recorded and kept. There was an admission that they had had an aninternal meeting with their legal advisors to see if the party was defaming Cable and andofficers of DBIS. Finally from November 2011 to January 2012, an investigation was held into whether I had committed a criminal offence in being the leader of the Libertarian Party. All of which was dealt with by a District Judge a year earlier, that Vince had no powers in this area. The consensus is that he was abusing his office for party political ends. In December 2011, Cable finally issued a personal apology for breaching the Ministerial Code and for withholding evidence properly requested. This was issued to my MP, with the note that lessons had been learned. I don’t think lessons have been learned, Cable is inept in office, duplicitous andopportunistic, he is disloyal and not averse to abusing his office and the Ministerial Code. An independent body is looking into all of these matters, I do not hold my breath. If this is the sort of man the Social Democrats want to lead them they are welcome to him. A few days ago the Orphans of Liberty website did a piece on the Libertarian Party UK and UKIP. In this article it was alleged that the Libertarian Party had ceased to exist. Something that was corrected by the Party Chairman Guy Montrose and a senior member of the party. As was equally expected this drew out the usual crowd of failed coup leaders who have now gone off to form their own parties. These parties are craving for attention, and defamation is their weapon of choice, Mr Gibbs constant outpourings of bile having the fortunate effect of coming across as the most unhinged. Libertarians are free to make their choices to what parties they wish to belong to (or to none). Most parties will put forward a platform of policies on which there can be a rational debate. These new parties it is to be suspected, as we do not know, have no policies other than to attack the Libertarian Party and myself personally. As a London centric grouping, they believe that they are the centre of the political universe, they are not. They completely ignore the growing Scottish Libertarian Party as they ignore the rest of the UK. If and when they can form a sensible set of policies that will appeal to the voting public remains to be seen. Yesterday was spent in the morning having a meeting with one of the business editors of the Daily Telegraph. Facts, figures, dates and correspondence were exchanged, and the alarming conclusion was reached that Chuka Umunna the Shadow Business Secretary was more of an impressive figure than the current incumbent of the office even though both have precious little business experience. At least one is prepare to learn, while the other made his mind up about the business community years ago. In the car on the way down to an ‘evacuated’ Olympic London, Mervyn King was doing his ‘we are all doomed act’ and the commentariat were talking about another twenty one summits to save the Euro. The Social Democrats (LD) were stampting their collective feet, over the fact that Gay ‘marriage’ and House of Lords Reform are not perceived as the most important issue of the day for the country. So we have a situation where the country is not being governed, but the State is still borrowing and printing money. As Douglas Carswell wrote, King is still dishing out the same medicine that made the country sick in the first place. I was pressed to go to the Sainsbury Wing of the National Gallery to see the Titian- Metamorphosis exhibition. The old master had three paintings in the entrance which were impressive, what was behind the portals was a pretentious verbiage of robots, ballet dance constumes and models of set designs. Clearly I am a barbarian at the gate, because I saw very little merit in this exhibition, other than chatting at a dinner party, saying ‘ I went to the exhibition and it was divine daarling”. Chris Ofili is a talent in his own right and should not have got involved in this project. Art that requires an A2 explanation sheet, a TV programme and an audio guide to tell you what to think is in my humble opinion does not elicit an emotional response to what is being portrayed. I therefore concede I am merely a Mercisc barbarian if this is art. It is not the shock of the new, merely the triumph of the trite.